International consultant and poet Frank Barone conducts workshops on the writing process and gives presentations on poetry. 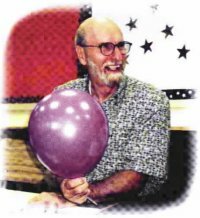 "The Man with the Purple Balloon" has delighted young and old with the stories behind his poems, almost always connected to the joy of writing. His latest book, Poetry Without Fear: Models for Teachers and Students, encourages students to play with words the way that "real" poets do. You've got to care to give. Frank cares. He has touched countless lives in the classroom, seminar room, teacher's lounge, and wherever he has been allowed to spread the joy of writing. Yes, Joy! Adults and children have warmed to this man and his smiling balloon of writing. Most of the pops and explosions, in the form of ideas and writing, have come after he has departed. "I can write. Yep, that's a poem!" Teachers have marveled at the work he has inspired emanating from their students and they have also gained immeasurably from his encouragement and gently prodding in their search for effective teaching and writing tools. My joy is in our friendship. He has encouraged, cajoled, and scolded me locally and by way of long distance lines to keep writing, even when it's a lot easier to just....stop. "To just quit is to just quit. Then what have you got?" Now we're writing and reading together; a little rhythm, a little blues and a few pops and explosions along the way. I can't think of a better way to spend the day. Can you?